The studio is where Janne Hieck, Gregory Hamilton Miller, and visiting artists develop their own work. Janne Hieck apprenticed in Germany and took her Master Potter certification from the Keramik School at Landshut. She has an interest in earthenware, soda and woodfiring, and teaches in Tolne, and around the world. Gregory Hamilton Miller apprenticed in Mashiko, Japan with Shimaoka Tatsuzo, where he discovered a love for Japanese pottery and aesthetics. He is interested in slip glazing, raw firing, salt and woodfiring, and passing on his knowledge of these techniques. He also leads tours to pottery communities in Japan. Different people work in our studio. Gregory has his Leach wheel, and Janne works on a Shimpo. You might find Noguchi Etsuji from Japan, or Waleed Qaisi from Iraq, or almost anywhere else in the world. You can see pieces by resident artists, and others who come by for our open studio clases on Tuesday evenings, where you can try your hand at ceramics too. The studio has an eclectic bunch of wheels, boards, slips, clay, glazes and work in progress. Stop by and be part of it! The studio can accommodate up to 14 ceramic course members and is well equipped. Explore different international techniques with outstanding facilitators and instructors, about topics that interest you. You can deepen your understandings of clay, glazes and make special firings using salt, soda, and woodfiring. Why not reserve a special week for your group of 8 to 12 art enthusiasts at Tolne Gjæstgivergaard? It is a chance to work together with new materials, techniques and firings in a focused, interesting way, in a relaxing setting. The gallery features our own work and guests artists too. 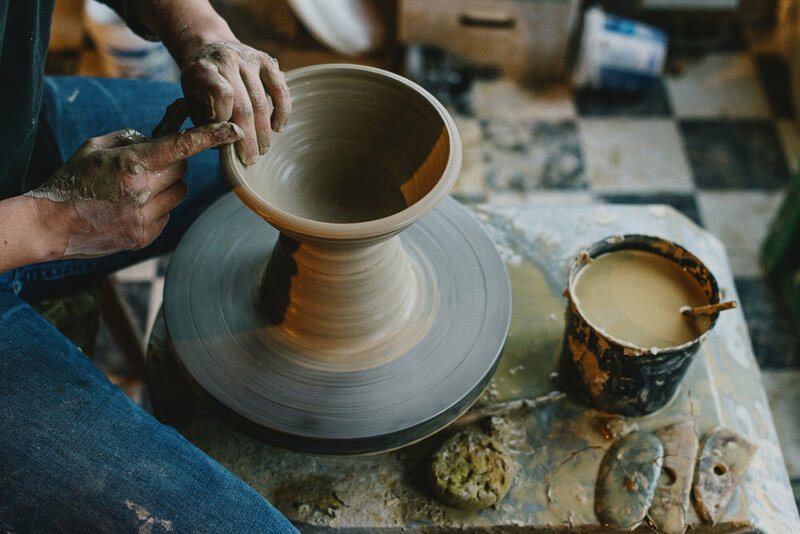 You can expect to see familiar forms like cups, bowls, plates made with stoneware and porcelain clays, ash and other natural material glazes, and special firings using salt, soda and woodfiring. Each piece is unique and has a special record of making, a chance to become something dear to you, or the person you give it too. Ask us about the history of any of the work in our gallery, and we´ll be happy to tell you the details. If you are visiting our gallery, maybe it is a good idea to stop for a cup of tea and a piece of cake in our Café inside, where you can also pick out your own piece to have your coffee from.